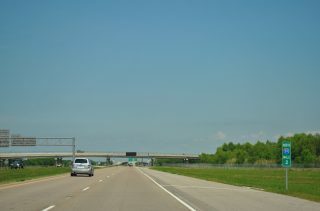 Interstate 510 provides a high speed route to St. Bernard Parish from Interstate 10 in conjunction with Louisiana 47 (Paris Road). Cosigned with Louisiana 47, Interstate 510 constitutes a freeway spur linking I-10 with Chalmette and St. Bernard Parish. The three-mile route serves areas of New Orleans East, the Almonaster-Michoud Industrial District and NASA’s Michoud Assembly Facility. Milemarkers with the route shield were installed in Louisiana starting in 2011. Photo taken 04/20/12. The outer belt connection was envisioned along with proposed freeways along Florida Avenue northeast of Downtown New Orleans and the Louisiana 3139 / Earhart Expressway Extension west to the New Orleans International Airport (MSY). The Florida Avenue freeway would have connected to I-10 and I-610 near their eastern meeting and continue east to Interstate 510. The extension of Interstate 510 would resurrect the old I-410 proposal and provide a third freeway connection to the west. Despite the inclusion in the Statewide Transportation Plan Update,1 plans for this freeway did not advance. Interstate 510 & Louisiana 47 continue one mile north from the diamond interchange (Exit 1B) with Lake Forest Boulevard to meet Interstate 10 at Exit 1A. Photo taken 05/09/15. A viaduct carries Interstate 510 & Louisiana 47 north between Lake Forest Boulevard and Interstate 10. An auxiliary lane accompanies the roadway between Exits 1B and 1A. Photo taken 05/09/15. Interstate 10 travels 18 miles northeast from I-510 to Slidell and 15 miles and 12 miles southwest to Downtown New Orleans. Photo taken 05/09/15. Exit 1A partitions from I-510 for both ramps to Interstate 10. Louisiana 47 continues northward along Paris Road to Hayne Boulevard west at the Little Woods neighborhood. Photo taken 05/09/15. A multi level systems interchange joins I-10 and I-510 to the west of Michoud Boulevard and Bayou Sauvage National Wildlife Refuge. Photo taken by Jeff Royston (05/27/00). Louisiana 47 (Paris Road) leads south from Hayne Boulevard at Little Woods and transitions into Interstate 510 south at the unnumbered off-ramp to I-10 west. Photo taken 05/09/15. Exit 1A loops onto Interstate 10 east to Slidell and the Mississippi Gulf Coast. I-510 & Louisiana 47 pass by the former Six Flags New Orleans theme park ahead of Lake Forest Boulevard. Photo taken 05/09/15. Interstate 10 west passes under Michoud Boulevard 1.50 miles ahead of I-510 south & Louisiana 47 (Exits 246A/B). Photo taken 05/09/15. Traffic from Michoud Boulevard merges onto I-10 west, 0.75 miles out from the cloverstack interchange with Interstate 510 south & Louisiana 47. Photo taken 05/09/15. LADOTD recorded 70,738 vehicles per day (vpd) along I-10 leading west to Interstate 510 and LA 47 in 2016. Photo taken 05/09/15. A single lane off-ramp carries all traffic to Interstate 510 south and Louisiana 47 at Exit 246. Original construction of I-510 replaced the diamond onterchange here with Paris Road. Photo taken 05/09/15. Exit 246 separates for LA 47 (Paris Road) north to Little Woods and I-510/LA 47 south to the NASA Michoud Assembly Facility and Chalmette. Photo taken 05/09/15. Interstate 510 south & Louisiana 47 join Interstate 10 east with Little Woods in New Orleans and the St. Bernard Parish seat of Chalmette from Exit 246A in three quarters of a mile. Photo taken 04/20/12. Advancing toward I-510 south and LA 47 on I-10 through New Orleans East. 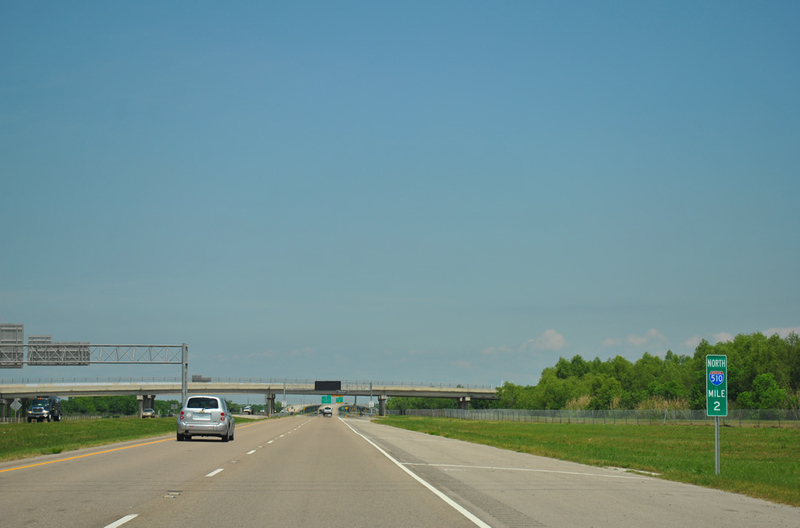 Interstate 10 maintains at least six lanes throughout New Orleans and northeast to I-12 and I-59 at Slidell. Photo taken 04/20/12. Separate ramps link I-10 east with I-510/LA 47 south to Chalmette and the Intracoastal Waterway bridge into St. Bernard Parish and LA 47 north along Paris Road. Photo taken 04/20/12. Interstate 510 concludes at a diamond interchange (Exit 2C) with Almonaster Boulevard. 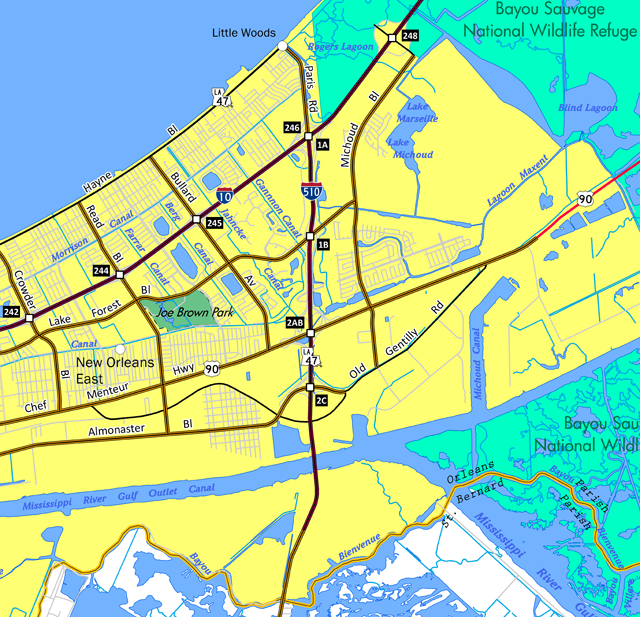 Louisiana 47 (Paris Road) extends another six miles southward across the Intracoastal Waterway to Chalmette in Saint Bernard Parish. Photo taken 05/09/15. The initial guide sign for Exit 2C along Interstate 510 north precedes the Intracoastal Waterway bridge along Louisiana 47 (Paris Road) northbound. Photo taken 06/09/10. Louisiana 47 north crosses a 135 foot high steel arch bridge over the Intracoastal Waterway leading to the exchange (Exit 2C) with Almonaster Boulevard at Interstate 510. Photo taken by Steve Hanudel (08/15/05). The Intracoastal Waterway bridge along Louisiana 47 (Paris Road) opened in 1967. Photo taken by Steve Hanudel (08/15/05). Forthcoming Almonaster Boulevard connects I-510/LA 47 with Old Gentilly Road east to the NASA Michoud Assembly Facility and west to the New Orleans Business and Industrial District. Photo taken 04/20/12. Interstate 510 commences at the base of the Intracoastal Waterway bridge as Exit 2C departs from LA 47 north. Photo taken by Steve Hanudel (08/15/05). “Edwards to Open I-510 Link.” The Times-Picayune (New Orleans, LA), November 14, 1992. “I-510 Link is Nearly Complete After 7 Years of Construction.” The Times-Picayune (New Orleans, LA), October 13, 1992. Page updated February 8, 2019.